They did a quality job and they were very competitive price-wise. I thought they were honest about what I needed and they gave more options and they didn't throw a bunch of money at it. They were very informative and very quick to respond. They responded right away when I called. They diagnosed the problem right away and they were upfront about what my options were. They didn't try to sell me the most expensive solution to the problem. They did exactly what they said they were going to do. They charged what they said they were going to charge and got here and they cleaned up. It was easy, nothing was complicated about it. 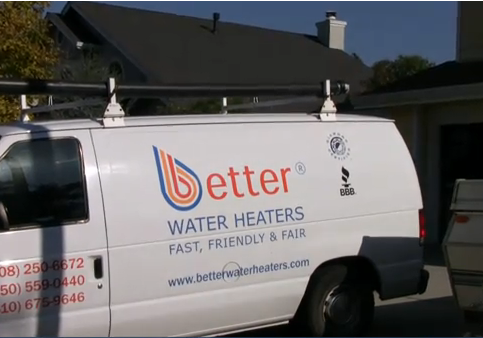 Better Water Heaters services and replaces water heaters for residential and commercial clients throughout the Bay Area. The company has expertise with both conventional and tankless heaters, and its service vehicles are equipped to complete installations in one visit. It also repairs plumbing leaks, replaces shut-off valves, offers residential copper repiping, installs and replaces recirculating pumps and pressure regulators, and more. Better Water Heaters receives volume purchasing discounts on its water heaters and components, which allows it to offer similar discounts to its clients, says Mr. Cartwright. The company’s technicians undergo continual training to stay updated on the industry’s technological advancements, and all installations are performed in strict compliance with plumbing and building codes. 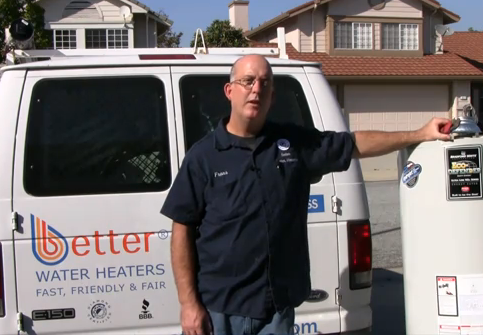 Owner Frans Cartwright stands in front of one of Better Water Heaters’ service vans. 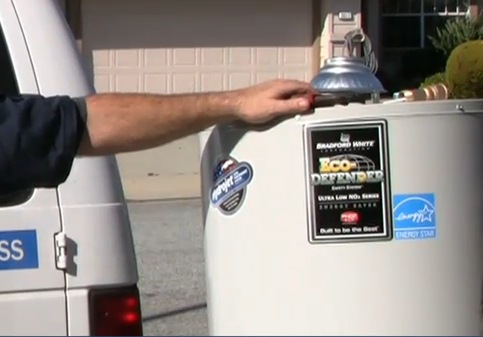 Preventive maintenance is the key to increasing the efficiency of your tankless water heater. • To extend the life of your water heater, drain the tank annually to remove any sediment that may have built up inside it. Follow the manufacturer’s suggestions and use caution when draining—the water can be extremely hot. • Setting the water heater’s thermostat to mid- or low-range will prevent interior scalding and save on energy costs while still providing plenty of hot water. • Purchase a hot water insulation jacket for your water heater—it’ll keep the water heated longer, reduce standby heat loss (heat lost through the walls of the tank) by 25 to 40 percent and further save on heating costs. • If you have a gas furnace/stove and an electric water heater, consider extending the gas line to the heater to save on energy costs. Electric water heaters cost approximately three times more to run than systems that use natural gas. • Install water-saving showerheads in your bathrooms and aerated faucets in your sinks. This reduces the amount of hot water used, which in turn reduces energy costs and extends the water heater’s life span. • Insulate your pipes to reduce heat loss as hot water flows to your faucet. More important, this will reduce standby heat loss when the tap is turned off and back on later. The water in the pipes will eventually cool either way, but if the pipes are insulated, the water will stay warmer for much longer. 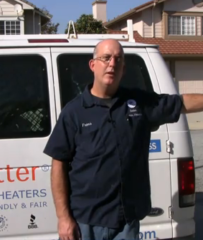 • Have your water heater inspected by a certified technician at least once every couple of years. Regular upgrades and repairs will help keep the system in optimal working condition and prevent dangerous carbon monoxide problems. • Have a certified technician replace the heater’s anode rod every five years or so. This small, metal device sacrifices itself for the good of the entire unit. The corrosive chemicals in the water are drawn to the anode rod instead of eating away at the inside of the tank. Q: Can you complete my installation in less than a day? Q: Can my old water heater be repaired? Q: How often should I drain my water heater? Q: Can you take shortcuts to save me money? Q: Do you offer any special discounts for Diamond Certified customers? Frans Cartwright is a 13-year veteran of the plumbing industry and owner of Better Water Heaters, a Diamond Certified company since 2006. He can be reached at (650) 557-3559 or by email. A: Sen Dai Sushi in Milpitas. A: Marbles. I still have a bunch of them from when I was a kid. SAN JOSE — When choosing a water heater for your home, you have two options: a conventional water heater or a tankless model. Before making your choice, it’s important to learn more about the costs and maintenance involved with each. A conventional (tank) water heater is the type found in most homes. Today’s tank water heaters can produce 75 gallons of hot water per hour and have an annual operating cost of about $277. With conventional models, maintenance is crucial for maximizing operating lifespan. Once a year, have your water heater’s tank flushed to clear out sediment buildup. Under the right circumstances, a tankless water heater can provide substantial energy savings, with an average annual operating cost of only $177. In addition, at 300 gallons of hot water per hour, a tankless water heater can supply more than three times that of a conventional one. While the cost of installation can vary depending on the compatibility between a tankless model’s connections and a home’s existing plumbing system, many newer models are designed to be compatible with conventional connections. Even though a tankless water heater may cost more to install than a conventional model, they offer significant benefits if you have a need for unlimited hot water or a desire to save on energy costs. SAN JOSE — Host, Sarah Rutan: When choosing a water heater, you’ll need to decide whether to install a conventional or tankless water model. Today we’re in San Jose with Diamond Certified Expert Contributor, Frans Cartwright of Better Water Heaters to discuss some importance considerations. Diamond Certified Expert Contributor, Frans Cartwright: You have two options when choosing a water heater for your home; conventional water heater or tankless water heater. Let’s talk about both. The conventional water heater will be installed in about two hours, will produce 75 gallons per hour of hot water, and will do so for about $277 a year in gas costs. It’s important to flush this water heater once a year as it will last longer if you do so. Over here we have one of the newest tankless models out right now. This unit will be installed in about three hours. It has plumbing connections on the top just like your current water heater. It has a half-inch gas connection at the bottom so we don’t need to run a new gas line for this unit. And surprisingly enough, this has a two-inch plastic flexible vent right here. This will be inserted in your current metal vent up to the roof stack and will make this unit installed quite easily. This will produce about 300 gallons per hour and will do so for about $177 a year. 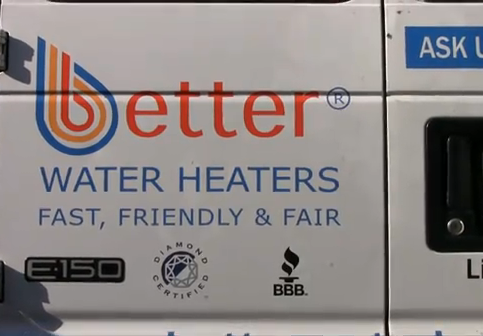 Better Water Heaters : Average 9.0 out of 10 based on 308 unique customer surveys of customer satisfaction. They were courteous and they put the appliance exactly where I wanted it to be. He explained the whole system to me and gave me knowledge about maintenance of the system. The installer did a good job. That they are trustworthy, they provided a quick solution, and they were friendly and helpful. The representative was very personable and honest. They did the job quickly when I needed it done quickly. They showed up, installed everything, cleaned up and left, very simple. They were easy to use for the most part. They did everything we expected. They were good one time. And that one time, they were not so good. Once I explained the problem, they were quick to fix it. They are the best in the market. They were fast and very knowledgeable. I would recommend them highly and I wouldn't use anyone else. They never got tired of talking to me. They put on circulating pumps that keep the hot water hot all the time for me. I had an issue with one of the pumps and they kept talking to me about it and it was great. I was really pleased. I thought the work was done quickly, they were friendly, and professional. They were respectful, being in our home. They just get things done. They came in and they did their job and they got out of there. The technician who came over was professional. they kept their appointment on time. The technician who came over was professional, finished the job on time, and showed up on time. The service was pretty fast. I was able to get an appointment within 10 days. For the most part, the service was pretty great and he was able to come the same day. They were extremely easy to deal with and we had a very difficult job to do and I offered to let them TO wait until the rain stopped, but they insisted on getting me back with hot water. What I liked best was that they return phone calls immediately and the service was very good and they were right with me the whole way and they were able to complete a very difficult job.